Lock in your favorite boat tour at the best price! We suggest booking in advance for an unforgettable day at sea. What's the first thing you should do during your visit to Italy's island of Capri? Rent a boat to explore the spectacular coastline and grottoes by sea! Taking a boat trip around the island is one of the most unforgettable experiences you can have on Capri. Here are the different types of boats available for rentals and charters on Capri, with or without a skipper. Under each category of boat, you'll find tours and special offers you can book online. 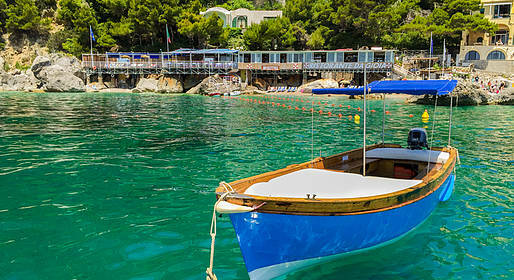 Do I need a boating license to rent a boat on Capri? 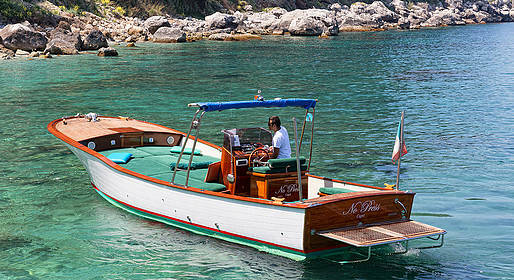 There are certain categories of boats, including a dingy or small lancia, which can be rented without a boating license. However, if you have never navigated a boat before, it's best to opt for a rental with skipper. Are there less expensive alternatives than renting a private boat for a tour? Yes, you can take an organized group boat tour. Tickets cost less than EUR 20 per person, the tour takes about 2 hours, and there is a stop to visit the Blue Grotto (you must purchase your ticket separately). The companies which offer these group tours are Laser Capri and Motoscafisti Capri. 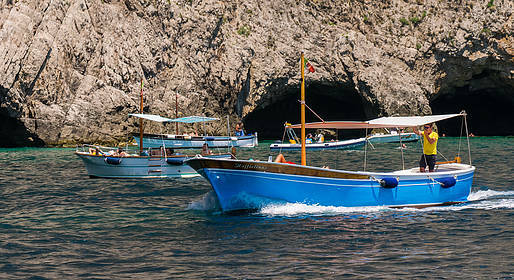 During your boat tour, you can arrange to stop at the Blue Grotto. Unfortunately, the grotto is not always open as the cave mouth is only a meter above sea level, so the sea must be calm to allow visitors to pass through safely. You will have to transfer to one of the small rowboats which transport passengers inside the cave from your rental boat, and lie back to pass through. Tickets to the Grotto cost EUR 13 and in high season there is often a long wait to enter. If you have rented a boat without a skipper, you can anchor your boat to one of the buoys outside the cave entrance and wait for a rowboat to come and pick you up. 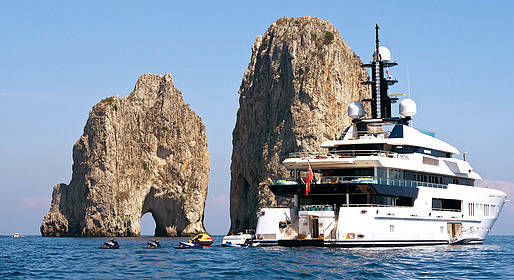 Can I rent a boat to transfer between Capri and Positano or Amalfi? Of course! There are a number of boat rental companies which offer tours of Capri or the Amalfi Coast with departures from the island and arrivals on the mainland, or viceversa. A large gozzo or speedboat is always used for these tour-transfers. Where do I rent a boat? 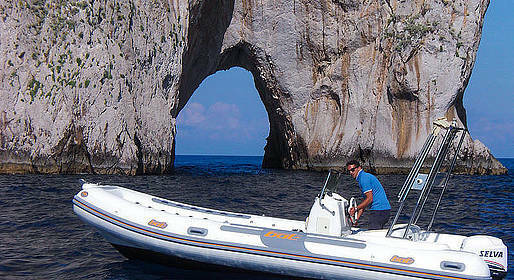 Almost all the boat rental companies on Capri are located in Marina Grande near the port and marina. There is just one company located in Marina Piccola on the southern coast of the island. Relax on board our luxury speedboat for an entire day on the waves and enjoy the magic of the Amalfi Coast's most famous spots like Positano, the Li Galli Islets, the Ieranto Bay, Furore, and Amalfi from the water. Stop for a dip in the most beautiful spots along the coast! 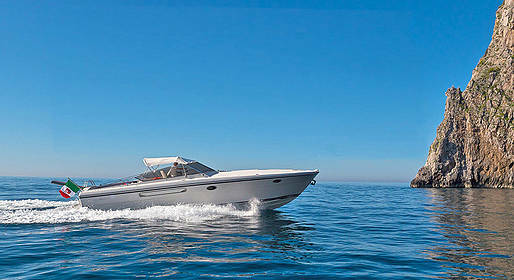 A day on an open speedboat; comforts like a cabin and shower; welcome aperitivo and free minibar.